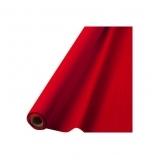 Our Apple Red Jumbo Plastic Table Roll is perfect for all party occasions! Table roll is durable, reusable and measures 40" x 250'. Simply roll out to fit table and cut at the desired length.